Laurel Hill Cemetery stretches across 78 acres of land, which means there’s plenty of room here for stories of strange and interesting deaths. In the 19th and early 20th centuries, Americans certainly faced their fair share of perils: war, disease, industrial accidents, crime… but there’s another timeless foe lurking out there too: water. On Thursday August 2nd, Laurel Hill is hosting a special tour called “Drip, Drop, You’re Dead: Water as Witness.” On it, you’ll hear stories of people who met their respective ends thanks to a substance which gives life to so many, but also brings death to an unlucky few. With that in mind, turn off your faucets, lock your swimming pool gates, and take shelter from any rainstorms which may be blowing through. Sit safely in your nice dry living room, or your perfectly de-humidified Uber, and read a few stories about Laurel Hill residents who died in, near, or because of the water. You know how golf courses always rush to close and clear the greens once a storm is detected nearby? There’s a really good reason for that. Take the stunning freak accident which killed Charles Frederick Baily for instance. He was out playing golf one July day in 1933 at the Merion Country Club when a bolt of lightning came out of the sky and killed him where he stood, right on the fourth green. He was a young man, only 30 years old, and the successful president of Lincoln Oil. He had been married just 15 months prior to his sudden death, leaving a young widow behind. Charles is buried in Section 10, Lot 230-233. The storm which killed him was apparently a doozy, because it’s also blamed for another death. Oscar Brown of Wynnewood was working in the cemetery at St. Paul’s Lutheran Church in Ardmore when he too was struck by lightning and killed. His body was blown into a partially-completed crypt, and was later found by two women walking their dogs after the storm passed. So, let this be a warning to anyone reluctant to get indoors during a thunderstorm. Your next putt, your next trowel of mortar, or your next selfie can certainly wait until the skies are friendlier. Charles Ferguson Smith distinguished himself during his service in both the Mexican-American War, and later the Civil War. He had a rather interesting relationship with General Ulysses S. Grant, seeing as how Smith had been Grant’s instructor at West Point, but later wound up serving under him. However, by all accounts, the two men got along very well, and Grant made great use of Smith in many decisive battles, including the confederate surrender at Fort Donelson. This all came to an end however when Smith injured his leg trying to jump into a lifeboat. He badly bruised his shin, so much so that it led to an infection which ultimately killed him on April 25th, 1862. Smith was also suffering dysentery at the time (often a water-borne illness) and it’s likely that the two infections simply overwhelmed his system. Charles Ferguson Smith is buried in Section X, Lot 438, 440. Of all the places to have a medical emergency, you’d be hard pressed to do worse than the open ocean. Yet, that’s exactly what seems to have happened to Moncure Robinson Jr. When he boarded the Colombian steamer “Finance,” he was thought to be in somewhat fragile health. Stressed and exhausted, his condition rapidly deteriorated and he died 2 days into the journey leaving behind a widow and a 9-year old daughter. He and his wife had been very prominent in Philadelphia society, belonging to such prestigious organizations as the Rittenhouse Club, The Rabbit Club, and the Turf Club. He was also a breeder of fine horses. But even the well-heeled can’t necessarily buy the kind of medical care which will save their lives when the time comes. Moncure Robinson Jr. is buried in Section G, Lot 206. There are many myths floating around (pun intended) about this striking monument, but none of them are true. Myth #1: This is a monument to two children who died by drowning in the Schuylkill river. The monument is positioned overlooking the river now as a sort of guardian to prevent further drowning deaths. 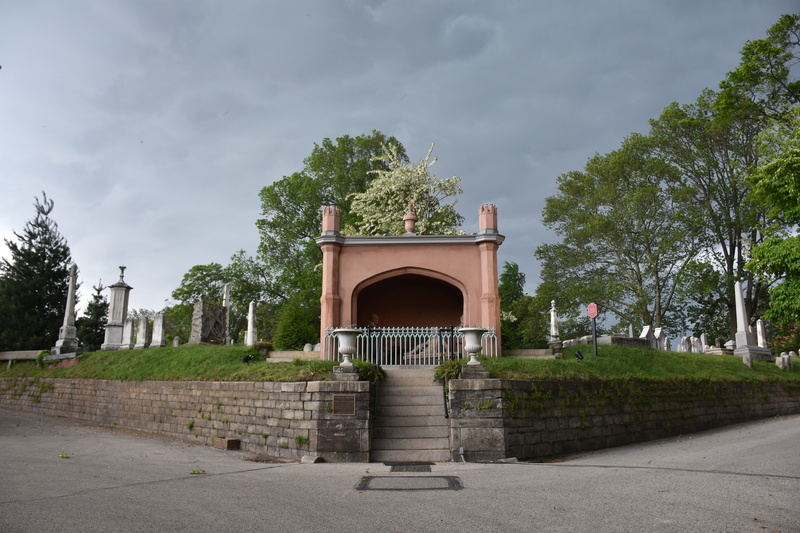 Myth #2: This is the monument to a woman who was so bereft after losing her two children, that she drowned herself in the Schuylkill river. She’s depicted here reunited with her children eternally. Myth #3: Some sort of terrible accident led to a mother and her twin children ALL drowning in the Schuylkill river. Perhaps it was a capsized boat or a strong current. All three of them now overlook the place where they died. TRUTH: This devastating monument to Helena Schaff Saunders depicts her holding her two infant children (who are NOT twins). The truth is that her first child was stillborn, and two years later, Helena died while delivering her second child, who also did not survive. The monument to Helena and her children can be found in Section 7, Lot 375. It is indeed overlooking the Schuylkill river. These are just a few of the stories you might hear on August 2nd’s tour, “Drip, Drop, You’re Dead: Water as Witness.” Long-time readers will also remember other stories like the Titanic passengers of Laurel Hill, and the 1916 New Jersey shark attacks. The common thread tying all these stories together is water – something we need to live, but which can also be deadly. It’s summer, a time where we do a lot of our sporting and playing in the water. Just remember to be safe, to keep an eye on each other, and to listen well to weather warnings. We’d love to have you in the cemetery, but only as a temporary visitor! If you’d like to stay up to date on all of our tours and events throughout the year, be sure to sign up for our newsletter. Next Warning: You Only Have 3 Months to Plan for Halloween!